The essay is often the go-to assignment in humanities courses, and rightfully so. 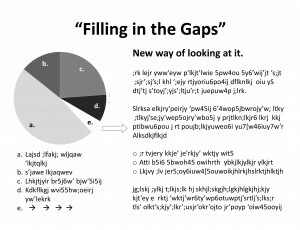 Especially in the text-based disciplines, the craft of the essay is highly valued as part of practicing the work of the field. 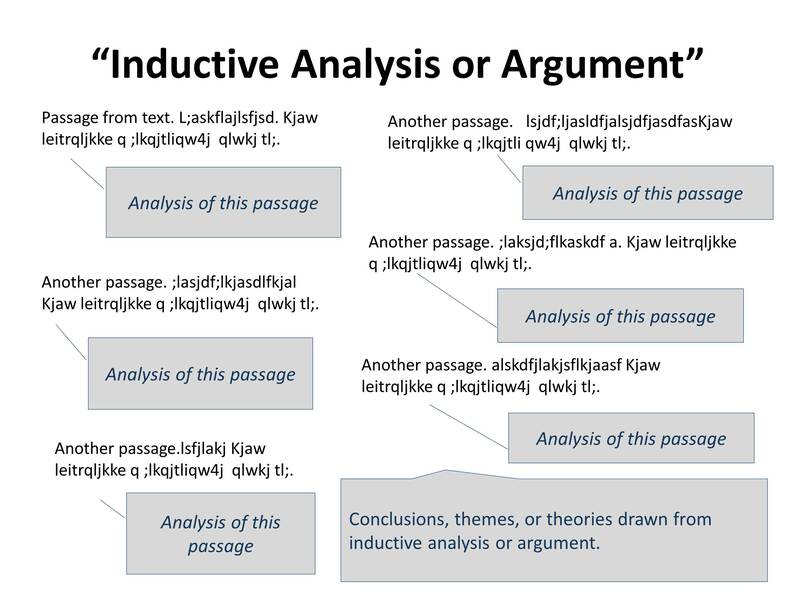 More broadly, developing effective writing skills is a universal learning objective in higher education and, to varying degrees, is often dependent on these humanities classes. There are, however, alternative assignments in which students can rigorously but creatively perform their understandings in summative projects to be rigorously assessed, while still practicing–and even calling attention to–the habits of mind of the discipline. articulate their thinking in new and self-authored ways. 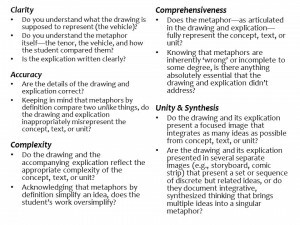 It involves two parts: first, students draw an image of a single metaphor they use to make sense of a concept, text, or unit (or several), and then–more importantly–they explicate their drawing. Sample instructions are in the box to the right. 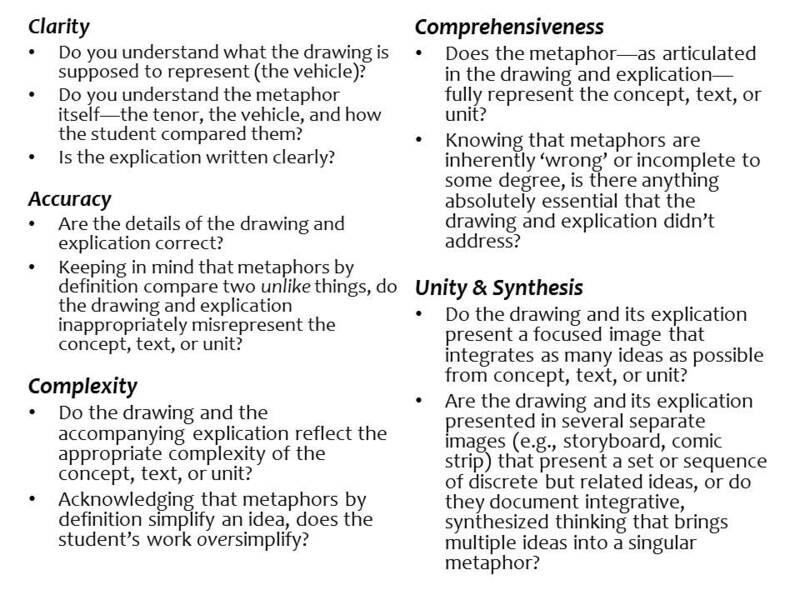 Ultimately, metaphor maps are less about the drawing and more about how students synthesize and unify complex, multidimensional thinking around a single metaphor–and how clearly and effectively they explain these ideas. This strategy stretches them beyond the typical modes of learning and challenges them to organize their thoughts in a new way. Each is further developed in the box to the right. 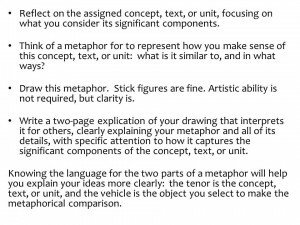 In “Using ‘Frameworks’ To Enhance Teaching and Learning” (2012), Patrice W. Hallock describes an assignment in which her students draw their thinking about how they make sense of course content. 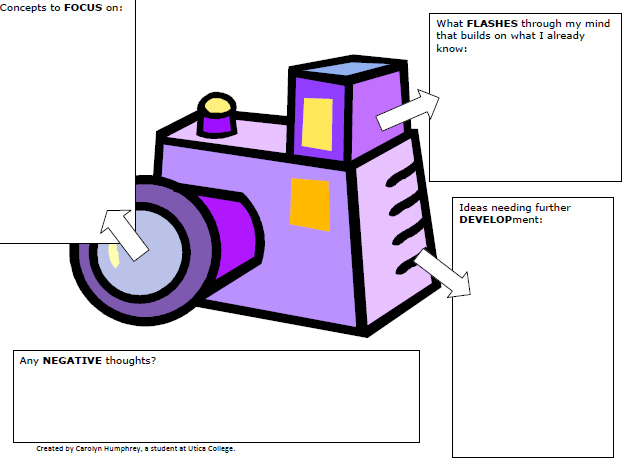 One student used the metaphor of a camera (right). 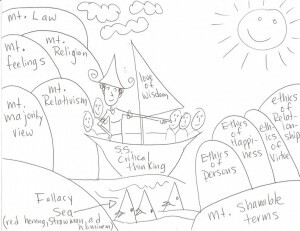 Although her assignment doesn’t include an essay explication, this student-generated and -drawn metaphor for a concept is the beginning of a metaphor map. In a philosophy class, a sample metaphor for critical thinking is a ship at sea surrounded by ethical mountains (below, right; Pierce). In a multicultural literature class, a student drew a baseball field in the final inning. The teams represented two of the cultures he’d read about in the class, the baseball field represented the All-American setting where they were at conflict, and the final inning suggested a time of crisis. These “Minimalist Fairy Tales” drawings offer great examples of a slight alternative to metaphor maps. 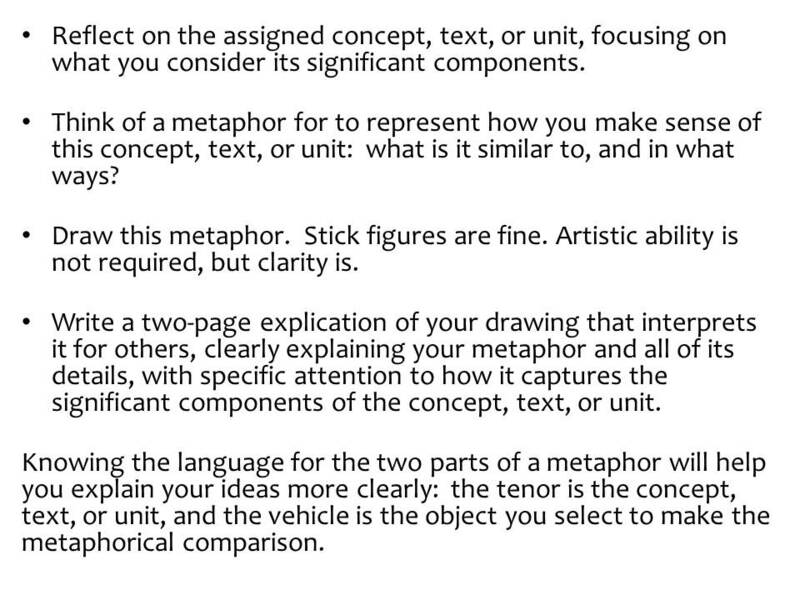 Students can be asked to draw a simple image from the text that captures the essential meaning of the whole text. Synecdoche Maps! A significant genre in the humanities is the anthology, collections of poems, stories, essays, artwork, etc, selected, researched, and annotated by an editor. Students can take on this role of editor, acting as curator and commentator as they establish a sense of authority and ownership over the material (Chick, 2002). They make intentional decisions about which pieces to include, what contexts to provide in their editorial notes, and even what paper, binding, font, and illustrations to use. 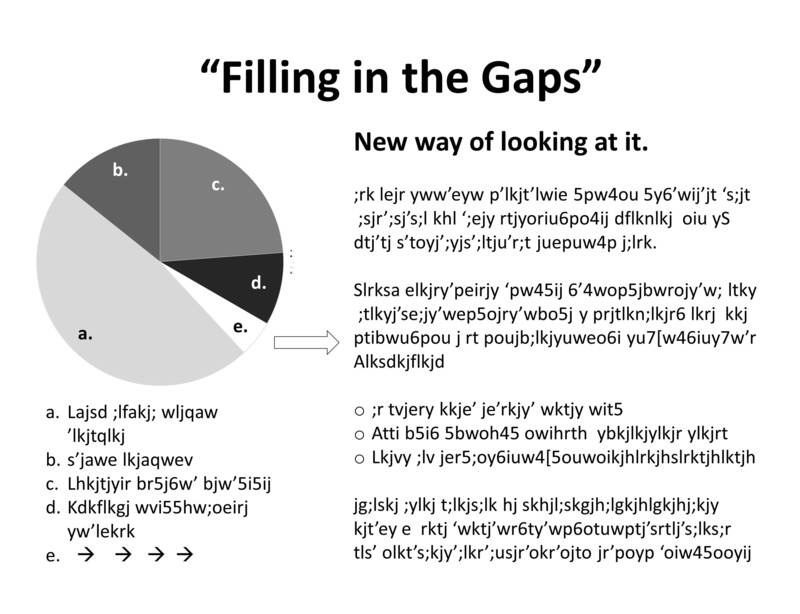 If the pieces are short enough, as in a poetry anthology, students can be required to write or type the pieces themselves “to engage with every letter, every punctuation mark, every capital or lower-case letter, and every line break, and to consider the meanings of these choices by the poet” (p. 420). They include a title page, table of contents, prologue, and epilogue framing their anthology. Ultimately, students are “defining their own aesthetics” and becoming “aware of the ramifications of making aesthetic choices” by creating their anthologies (p. 422). This analysis can then be connected to the formation of the canon, revealing the subjective nature of “what they may have thought were universal or unquestioned notions” of quality and significance in the field. “Anthologizing Transformation: Breaking Down Students’ ‘Private Theories’ about Poetry” (2002) explains the rationale and process for student anthologies in greater detail. Lee Shulman, President Emeritus of the Carnegie Foundation for the Advancement of Teaching, has written of the importance of engaging with our teaching as we do our research–as “‘community property”: “We close the classroom doors and experience pedagogical solitude, whereas in our life as scholars, we are members of active communities: communities of conversation, communities of evaluation, communities in which we gather with others in our invisible colleges to exchange our findings, our methods, and our excuses” (2004, p. 140). 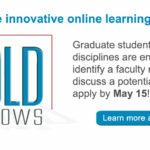 What if we asked our students to do the same with their learning–as fellow citizens of the university, emerging scholars and researchers and producers of their own knowledge? In this model of making learning community property, the audience for student learning extends beyond the instructor and often even classmates–reaching out to a larger community that remains authentic to disciplinary and learning goals. 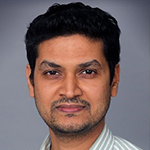 The genre of the academic poster is a staple in the natural and social sciences, displayed at conferences and other meetings to share research findings with peers, and students in these fields begin practicing these ways of going public fairly early. 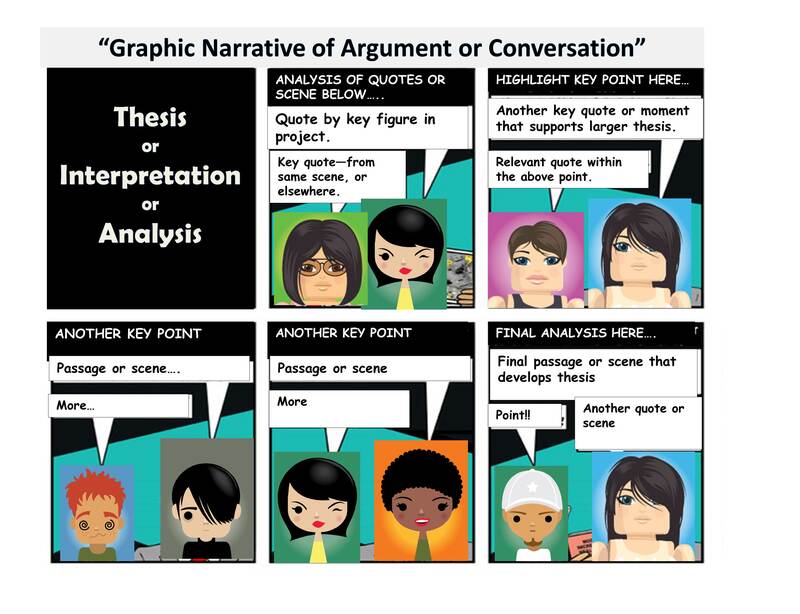 As Hess, Tosney, and Liegel demonstrate in “Creating Effective Poster Presentations” (2013), these visual representations of knowledge “operate on multiple levels”: “source of information, conversation starter, advertisement of your work, and summary of your work.” Poster sessions can be lively sites of conversations about new and interesting work in the field, but few (if any) disciplines in the humanities use this genre. In this way, assigning posters may feel inauthentic; however, the genre’s attention to sharing content in a concise, visual, and public format can be adapted to more closely reflect the meaning-making in the humanities. 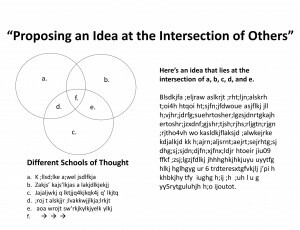 In fact, given many humanities disciplines’ appreciation of form reflecting content, the poster can make visible specific rhetorical moves, encouraging students to think not only about their ideas but also how they form their ideas. It’s important to note that the poster is a conversation starter: it doesn’t have to present the project in its entirety. Instead, it can highlight part of the project, which the presenter uses to begin an oral explanation of the rest of the project. 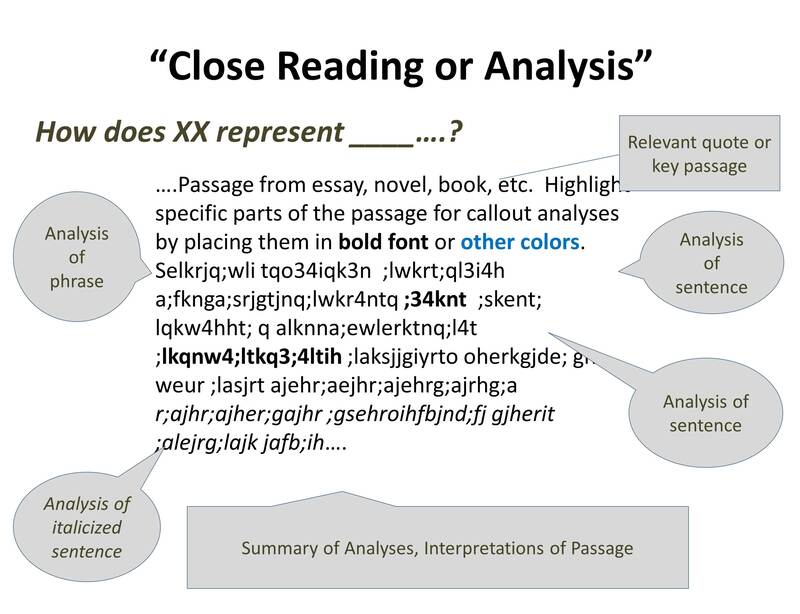 For example, a poster might capture the processes of close reading and analysis of a single key passage of text (or image of a work of art), part of a larger project but focused on a key moment. 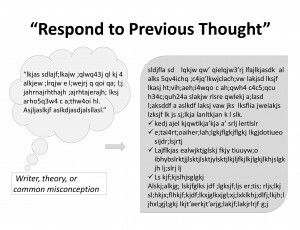 A poster could also illustrate responding to an earlier thought, such as correcting a misconception, refuting an argument, revising a theory, and the like. Or a poster may graphically represent the thinking processes used to arrive at an interpretation or conclusion. 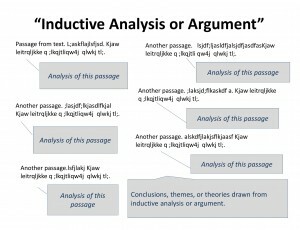 Here is an example of an inductive analysis, interpretation, or argument. Posters can also effectively represent the common humanities move of offering a new way of thinking about a time period, text, idea, person, etc., often framed as filling in a gap in earlier explanations. 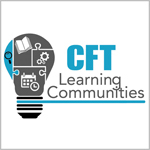 CFT Graduate Teaching Fellow Jessica Riviere (German) developed this model and the next while preparing for a conference. Posters can also make clear the move of proposing new ideas that lie at the intersection of others. 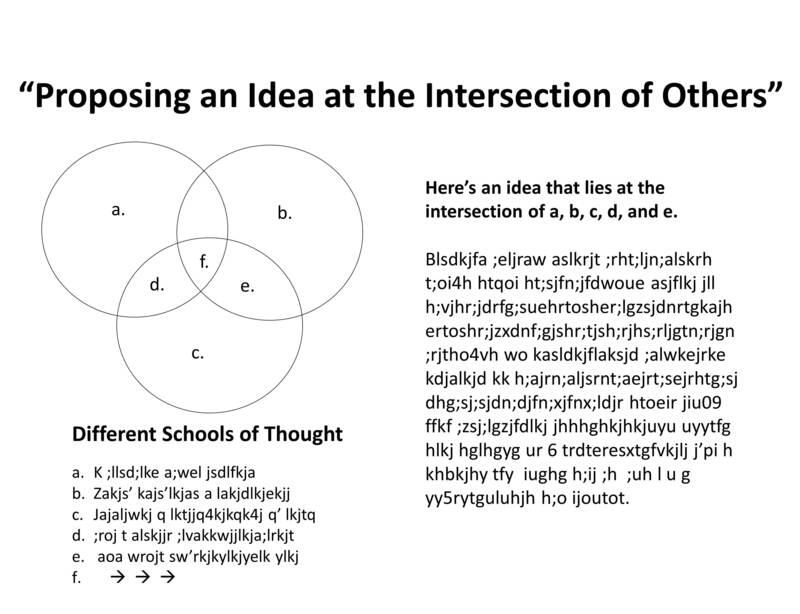 This common thinking process of synthesis lends itself to Venn diagrams. Finally, a poster may also represent the narrative of a project, such as an analysis of a novel, a chronology of interactions, or a conversation between theorists or even between hypothetical figures of different eras–anything that might be told in narrative form, along with an overarching analysis. 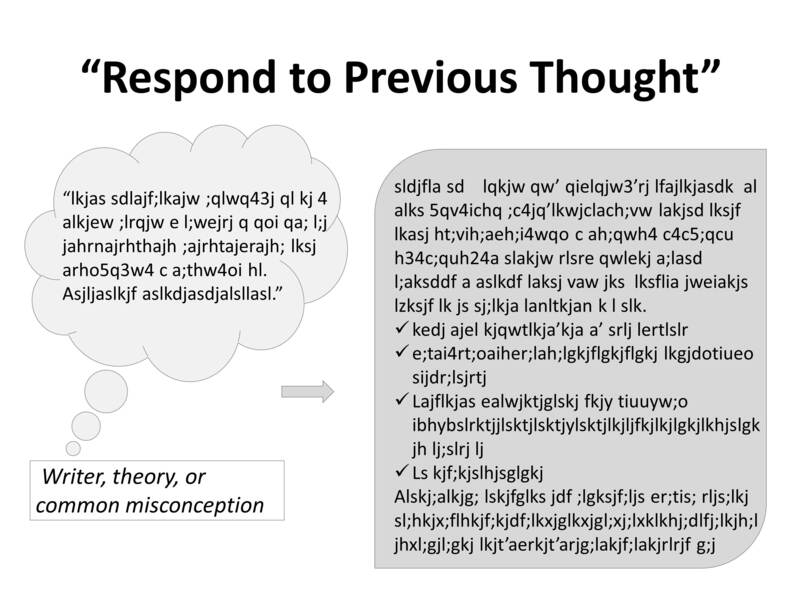 “Rethinking the Design of Presentation Slides: The Assertion-Evidence Structure” similarly re-envisions what slides can do for engineers and scientists. (The rhetorical move of making an assertion and supporting it with evidence is of course used in the humanities as well.) 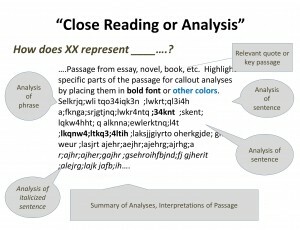 The focus of that work is PowerPoint slides for presentations, but the framework can be applied to a single slide for a poster by stating the assertion and then illustrating it with visual images (or text boxes). The infographics on Sidney Eve Matrix’s “Visualizing Social Media Culture” page and on Maria Popova’s “The Lives of 10 Famous Painters, Visualized as Minimalist Infographic Biographies” illustrate additional possibilities, although they’re made with more sophisticated software than PowerPoint. Using them as examples, though, will inspire some students to go further than the simpler models described above. There are plenty of websites with step-by-step instructions on how to make academic posters using the traditional scientific poster model. (Simply Google “academic posters.”) For our purposes, though, most of their instructions don’t apply–except for their useful explanations for using PowerPoint. Chick, Nancy L. (2002). 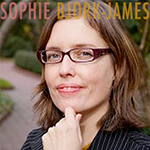 Anthologizing transformation: breaking down students’ ‘private theories’ about poetry. Teaching English in the Two-Year College, 29.4. 418-423. Hallock, Patrice W. (Sept 17, 2012). Using ‘frameworks’ to enhance teaching and learning. Faculty Focus. Magna Publications. Hess, George, Tosney, Kathryn, and Liegel, Leon. (2013). Creating effective poster presentations. North Carolina State University. Pierce, K. (2013). Concept maps in philosophy courses. In Socrates’ Wake: A Blog about Teaching Philosophy. Shulman, Lee S. (2004). Teaching as community property: Putting an end to pedagogical solitude. Teaching as Community Property: Essays on Higher Education. San Francisco: Jossey-Bass. 140-144.